As you look upward at Staunton’s buildings, you’re obviously looking at the handiwork of many men. Yet, one family of men contributed to the look and style of most of what you see. 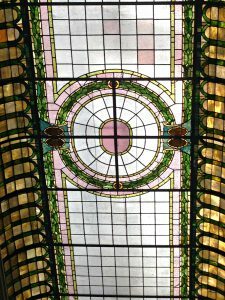 Architect T. J. Collins, his sons Will and Sam, and his grandson Joseph Johnson left an indelible mark on the architecture of the Queen City. Take a mini tour of the five historic districts in honor of Virginia Architecture Week. 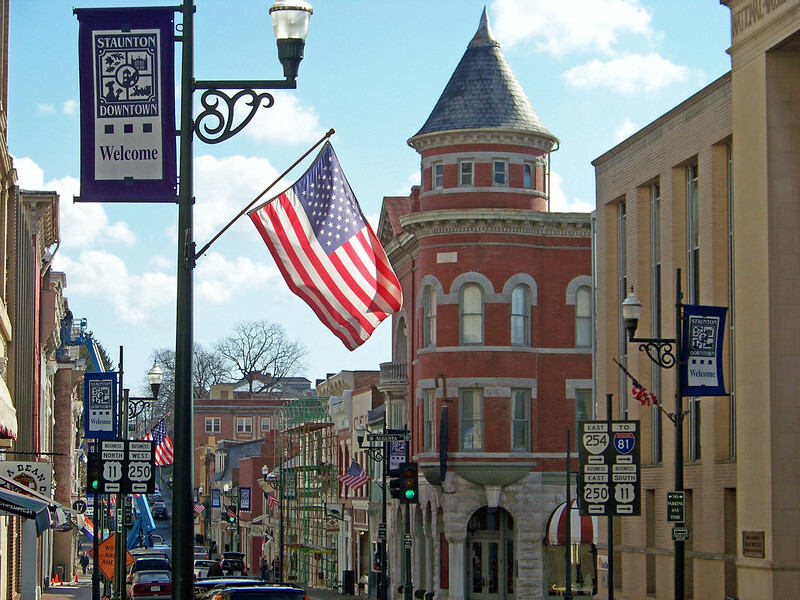 The center of downtown Staunton is the Beverley Historic District, an area found on the National Register of Historic Places. The buildings here date between the 1870s and 1920s, with one as old as 1830. That building is home to Cranberry’s Grocery & Eatery on S. New Street. Its previous uses include life as a laundry facility, taxi garage, print shop, and tailor’s studio. As you look up at the building, note the original stone still exposed on either side. Perhaps Staunton’s most recognizable architectural feature is the clock tower at the corner of Beverley Street and Central Avenue, city center. The building and tower date to 1890 and originally housed the YMCA and all its athletic space. Indeed, a bowling alley, gym and track resided behind those walls! Today the first floor is the Clocktower Restaurant and Bar and the Clock Tower Convenience Store. 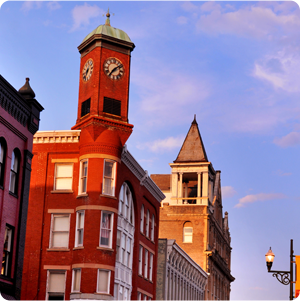 If the clock tower is Staunton’s most recognizable architectural gem, the 1896 Masonic Temple is the most imposing. Rising high above the rest of the skyline, the gable roof is quickly identifiable. In addition to its life as a Masonic Temple, the building houses Baja Bean Co., The Split Banana Co., and H. L. Lang & Co. Jewelers. 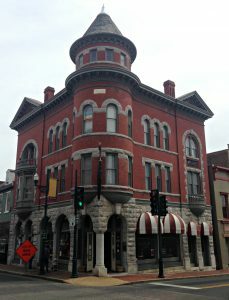 The T. J. Collins-designed National Valley Bank building on West Beverley Street was built in 1903 and is quite distinct from other buildings in Staunton. It’s of the Beaux-Arts style and features ornate exterior carved limestone. 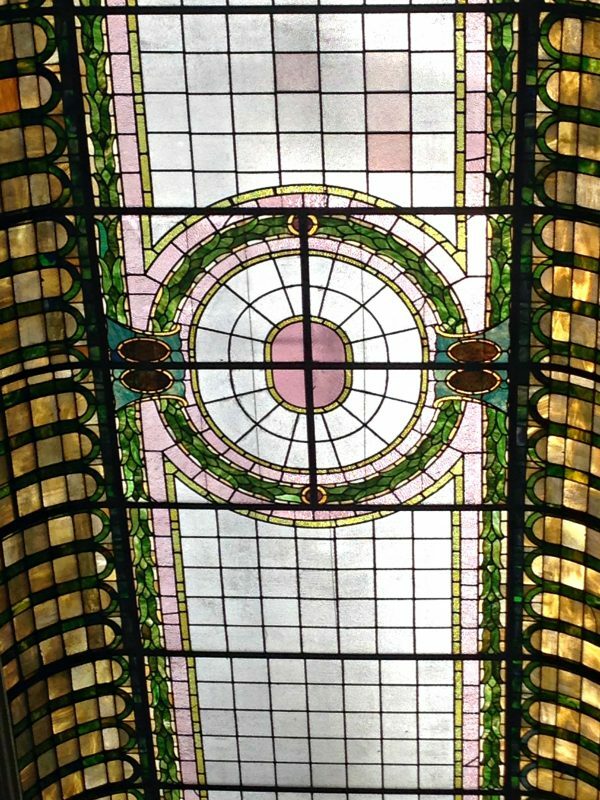 The 10′ x 34′ stained glass skylight is the highlight inside! One of the most beautiful buildings on New Street is the old Eakleton Hotel, now the R. R. Smith Center for History & Art. Designed by T. J. Collins in the French Second Empire style, the building boasts a series of three ornate iron balconies, arches, and mansard roof. The original windows are still intact in this 1894 structure that now houses the Staunton Augusta Art Center, the Augusta County Historical Society, and Historic Staunton Foundation. We’d be remiss to tell you about T. J. Collins and identify some of his genius without telling you where he drew his plans. On the Corner of Beverley and Augusta Streets is the distinguishable Marquis Building, notable for its rounded corner entrance and stone columns. The style is Romanesque Revival and the building is now home to the Beverley Cigar Store. 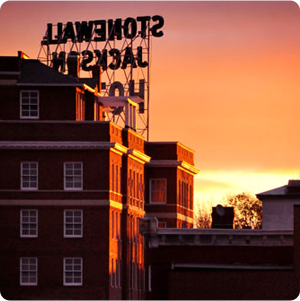 One of the youngest buildings in the Beverley Historic District is The Stonewall Jackson Hotel with its iconic neon sign atop the roof. The Colonial Revival was built in 1924 for $750,000, which would be close to a cool $10.5 million today. For perspective, 2005 hotel restoration, renovation and expansion came in at $21.5 million. Indeed, its the beauty that awaits inside that deserves nearly all of the attention. For example, guests are treated to a 1924 Wurlitzer Organ, believed to be the only remaining one of its kind. Additionally, the marble floors have been restored, and original features like the chandeliers and sconces remain in use. 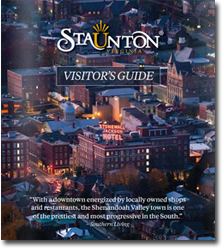 Visit the R. R. Smith Center to pick up your copy of “A Self-Guided Tour of Staunton’s Historic Districts” at the Historic Staunton Foundation for more information on the Beverley Street Historic District and its 10 other notable buildings. Or to complete your virtual tour check out the Historic Staunton Foundation’s Flickr Account and see the other architectural treasures unique to downtown Staunton. Check back each day as we continue our series on the Historic Districts of Staunton.